The majority of Jewish immigrants who made their way to the United States between 1820 and 1924 arrived nearly penniless. Yet today their descendants stand out as exceptionally successful. From itinerant rag traders to piece workers and entrepreneurs in the burgeoning garment industry, shmattes help us explain Jewish economic success in America. 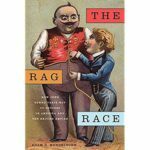 Adam Mendelsohn wrote the award winning book, The Rag Race: How Jews Sewed Their Way to Success in America and the British Empire. He is an Associate Professor of History at the University of Cape Town, South Africa, director of its Kaplan Centre for Jewish Studies & Research, and co-edits the journal, American Jewish History. Come early for best seats. No advance registration required.